Afghan President Hamid Karzai has met the emir of Qatar - for talks that were expected to consider the opening of a Taliban office in the Gulf state. Mr Karzai and Sheikh Hamad bin Khalifa al-Thani discussed "issues of mutual interest" in Doha, the state-run QNA news agency said. It gave no details. 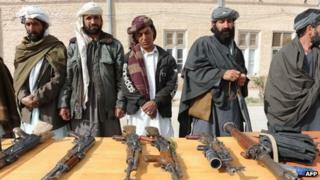 The opening of a Taliban office is seen as a step in formalising a channel for talks between Kabul and the militants. US-led Western troops are due to leave Afghanistan by the end of 2014. The Taliban itself has so far refused to talk to Mr Karzai, describing him as an American puppet, although it did hold inconclusive discussions with US officials last year. Last month, President Karzai issued an order banning Afghan security forces from calling in foreign air strikes in residential areas, because of heightened tensions about the extent of civilian casualties. Mr Karzai's office said the talks in Qatar would focus on bilateral co-operation and on Afghanistan's peace process. Before the meeting began, officials had said the possibility of a Taliban political office in Doha was likely to be raised. Mr Karzai and Pakistan's President Asif Ali Zardari said last month that they would work towards a peace deal for Afghanistan within six months. "The opening of the Taliban office in Qatar is not related to Karzai, it is a matter between the Taliban and the Qatar government," Taliban spokesman Zabihullah Mujahid told the Agence France-Presse news agency. "Our representatives who are already in Qatar won't see or talk to him." As the Afghan president's two-day visit began on Saturday, there were reports that two children and nine suspected Taliban militants had been killed in an air strike by international forces close to the south-eastern city of Ghazni. A Nato spokesman quoted by Reuters news agency said an Afghan police patrol had come under attack and had called in a helicopter for support. QNA reported later on Sunday that Mr Karzai had left Qatar.